In the American mind, if Apple made weapons, they would undoubtedly be drones, those remotely piloted planes getting such great press here. They have generally been greeted as if they were the sleekest of iPhones armed with missiles. 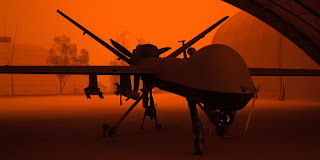 When the first American drone assassins burst onto the global stage early in the last decade, they caught most of us by surprise, especially because they seemed to come out of nowhere or from some wild sci-fi novel. Ever since, they've been touted in the media as the shiniest presents under the American Christmas tree of war, the perfect weapons to solve our problems when it comes to evildoers lurking in the global badlands. And can you blame Americans for their love affair with the drone? Who wouldn't be wowed by the most technologically advanced, futuristic, no-pain-all-gain weapon around? Here's the thing, though: put drones in a more familiar context, skip the awestruck commentary, and they should have been eerily familiar. If, for instance, they were car factories, they would seem so much less exotic to us. Think about it: What does a drone do? Like a modern car factory, it replaces a pilot, a skilled job that takes significant training, with robotics and a degraded version of the same job outsourced elsewhere. In this case, the "offshore" location that job headed for wasn't China or Mexico, but a military base in the US, where a guy with a joystick, trained in a hurry and sitting at a computer monitor, is "piloting" that plane. And given our experience with the haemorrhaging of good jobs from the US, who will be surprised to discover that, in 2011, the US Air Force was already training more drone "pilots" than actual fighter and bomber pilots combined? That's one way drones are something other than the futuristic sci-fi wonders we imagine them to be. But there's another way that drones have been heading for the American "homeland" for four decades, and it has next to nothing to do with technology, advanced or otherwise. In a sense, drone war might be thought of as the most natural form of war for the all-volunteer military. To understand why that's so, we need to head back to a crucial decision implemented just as the Vietnam War was ending. It's true that, in the wake of grinding wars that have also been debacles - the Afghan version of which has entered its 11th year - the US military is in ratty shape. Its equipment needs refurbishing and its troops are worn down. Thestress of endlessly repeated tours of duty in war zones, brain injuries and other wounds caused by the roadside bombs that have often replaced a visible enemy on the "battlefield", suicide rates that can't be staunched, rising sexual violence within the military, increasing crime rates around military bases, and all the other strains and pains of unending war have taken their toll. Still, ours remains an intact, unrebellious, professional military. If you really want to see a force on its last legs, you need to leave the post-9/11 years behind and go back to the Vietnam era. In 1971, in Armed Forces Journal, Colonel Robert D Heinl, Jr, author of a definitive history of the Marine Corps, wrote of "widespread conditions among American forces in Vietnam that have only been exceeded in this century by the French Army's Nivelle mutinies of 1917 and the collapse of the Tsarist armies [of Russia] in 1916 and 1917". The US military in Vietnam and at bases in the US and around world was essentially at the edge of rebellion. Disaffection with an increasingly unpopular war on the Asian mainland, rejected by ever more Americans and emphatically protested at home, had infected the military, which was, after all, made up significantly of draftees. Desertion rates were rising, as was drug use. In the field, "search and evade" (a mocking, descriptive, accurate replacement for "search and destroy") operations were becoming commonplace. "Fraggings" - attacks on unpopular officers or NCOs - had doubled. ("Word of the deaths of officers will bring cheers at troop movies or in bivouacs of certain units.") And according to Col Heinl, there were then as many as 144 anti-war "underground newspapers" published by or aimed at soldiers. At the moment when he wrote, in fact, the anti-war movement in the US was being spearheaded by a rising tide of disaffected Vietnam veterans speaking out against their war and the way they had fought it. In this fashion, an American citizen's army, a draft military, had reached its limits and was voting with its feet against an imperial war. This was democracy in action transferred to the battlefield and the military base. And it was deeply disturbing to the US high command, which had, by then, lost faith in the future possibilities of a draft army. In fact, faced with ever more ill-disciplined troops, the military's top commanders had clearly concluded: never again! So on the very day the Paris Peace Accords were signed in January 1973, officially signalling the end of US involvement in Vietnam (though not quite its actual end), President Richard Nixon also signed a decree ending the draft. It was an admission of the obvious: war, American-style, as it had been practiced since World War II, had lost its hold on young minds. There was no question that US military and civilian leaders intended, at that moment, to sever war and war-making from an aroused citizenry. In that sense, they glimpsed something of the future they meant to shape, but even they couldn't have guessed just where American war would be heading. Army Chief of Staff General Creighton Abrams, for instance, actually thought he was curbing the future rashness of civilian leaders by - as Andrew Bacevich explained in his book The New American Militarism - "making the active army operationally dependent on the reserves”. In this way, no future president could commit the country to a significant war "without first taking the politically sensitive and economically costly step of calling up America's 'weekend warriors'". Abrams was wrong, of course, though he ensured that, decades hence, the reserves, too, would suffer the pain of disastrous wars once again fought on the Eurasian mainland. Still, whatever the generals and the civilian leaders didn't know about the effects of their acts then, the founding of the All-Volunteer Force (AVF) may have been the single most important decision made by Washington in the post-Vietnam era of the foreshortened American Century. Today, few enough even remember that moment and far fewer have considered its import. Yet, historically speaking, that 1973 severing of war from the populace might be said to have ended an almost two-century-old democratic experiment in fusing the mobilised citizen and the mobilised state in wartime. It had begun with the levée en masseduring the French Revolution, which sent roused citizens to the front to save the republic and spread their democratic fervour abroad. Behind them stood a mobilised population ready to sacrifice anything for the republic (and all too soon, of course, the empire). Just calling in the professionals and ushering out the amateurs wasn't enough, though, to make the decision truly momentous. Another choice had to be married to it. The debacle that was Vietnam - or what, as the 1970s progressed, began to be called "the Vietnam Syndrome" (as if the American people had been struck by some crippling psychic disease) - could have sent Washington, and so the nation, off on another course entirely. The US could have retreated, however partially, from the world to lick its wounds. Instead, the country's global stance as the "leader of the free world" and its role as self-appointed global policeman were never questioned, nor was the global military basing policy that underlay it. In the midst of the Cold War, from Indonesia to Latin America, Japan to the Middle East, no diminution of US imperial dreams was ever seriously considered. The decision not to downsize its global military presence in the wake of Vietnam fused with the decision to create a military that would free Washington from worry about what the troops might think. Soon enough, as Bacevich wrote, the new AVF would be made up of "highly trained, handsomely paid professionals who (assuming that the generals concur with the wishes of the political leadership) will go anywhere without question to do the bidding of the commander-in-chief". It would, in fact, open the way for a new kind of militarism at home and abroad. In the wake of Vietnam, the wars ceased and, for a few years, war even fled American popular culture. When it returned, the dogfights would be in outer space. (Think Star Wars.) In the meantime, a kind of stunned silence, a feeling of defeat, descended on the American polity - but not for long. In the 1980s, the years of Ronald Reagan's presidency, American-style war was carefully rebuilt, this time to new specifications. Reagan himself declared Vietnam "a noble cause", and a newly professionalised military, purged of malcontents and rebels, once again began invading small countries (Grenada, Panama). At the same time, the Pentagon was investingthought and planning into how to put the media (blamed for defeat in Vietnam) in its rightful place and so give the public the war news it deserved. In the process, reporters were first restrained from, then "pooled" in, and finally "embedded" in the war effort, while retired generals were sent into TV newsrooms like so many play-by-play analysts on Monday Night Football to narrate our wars as they were happening. Meanwhile, the public was simply sidelined. Year by year, war became an ever more American activity and yet grew ever more remote from most Americans. The democratic citizen with a free mind and the ability to rebel had been sent home, and then demobilised on that home front as well. As a result, despite the endless post-9/11 gab about honouring and supporting the troops, a mobilised "home front" sacrificing for those fighting in their name would become a relic of history in a country whose leaders had begun boasting of having the greatest militarythe world had ever seen. It wasn't, however, that no one was mobilising. In the space vacated by the citizen, mobilisation continued, just in a different fashion. Ever more mobilised, for instance, would be the powers of big science and the academy in the service of the Pentagon, the weapons makers and the corporation. Meanwhile, over the years, that "professional" army, that "all-volunteer" force, began to change as well. From the 1990s on, in a way that would have been inconceivable for a draft army, it began to be privatised - fused, that is, into the corporate way of war and profit. Despite a paucity of real enemies of any substance, taxpayer dollars would pour into the coffers of the Pentagon and the military-industrial complex, as well as a new mini-homeland-security-industrial complex and a burgeoningintelligence-industrial complex, at levels unknown in the Cold War years. Lobbyists would be everywhere and the times would be the best, even when, in the war zones, things were going badly indeed. Meanwhile, in those war zones, the Big Corporation would take over the humblest of soldierly roles - the peeling of potatoes, the cooking of meals, the building of bases and outposts, the delivery of mail - and it would take up the gun (and the bomb) as well. Soon enough, even the dying would be outsourced to corporate hirees. Occupied Iraq and Afghanistan would be flooded with tens of thousands of private contractors and hired guns, while military men trained in elite special operations units would find their big paydays by joining mercenary corporations doing similar work, often in the same war zones. The All-Volunteer Force, pliant as a military should be, and backed by Madison Avenue to the tune of hundreds of millions of dollars to ensure that its ranks were full, would become ever more detached from most of American society. It would, in fact, become ever more foreign (as in "foreign legion") and ever more mercenary (think Hessians). The intelligence services of the national security state would similarly outsource significant parts of their work to the private sector. According to Dana Priest and William Arkin of the Washington Post, by 2010, about 265,000 of the 854,000 people with top security clearances were private contractors and "close to 30 per cent of the workforce in the intelligence agencies [was] contractors". No one seemed to notice, but a 1 per cent version of American war was coming to fruition, unchecked by a draft Army, a skeptical Congress, or a democratic citizenry. In fact, Americans, generally preoccupied with lives in which our wars played next to no part, paid little attention. Although early drone technology was already being used over North Vietnam, it's in another sense entirely that drones have been heading into America's future since 1973. There was an eerie logic to it: first came professional war, then privatised war, then mercenary and outsourced war - all of which made war ever more remote from most Americans. Finally, both literally and figuratively, came remote war itself. It couldn't be more appropriate that the Air Force prefers you not call their latest wonder weapons "unmanned aerial vehicles" or UAVs, anymore. They would like you to use the label "remotely piloted aircraft" (RPA) instead. And ever more remotely piloted that vehicle is to be, until - claim believers and enthusiasts - it will pilot itself, land itself, manoeuvre itself, and, while in the air, even choose its own targets. In this sense, think of us as moving from the citizen's army to a roboticised, and finally robot, military - to a military that is a foreign legion in the most basic sense. In other words, we are moving towards an ever greater outsourcing of war to things that cannot protest, cannot vote with their feet (or wings), and for whom there is no "home front" or even a home at all. In a sense, we are, as we have been since 1973, heading for a form of war without anyone, citizen or otherwise, in the picture - except those on the ground, enemy and civilian alike, who will die as usual. Of course, it may never happen this way, in part because drones are anything but perfect or wonder weapons, and in part because corporate war fought by a thoroughly professional military turns out to be staggeringly expensive to the demobilised citizen, profligate in its waste, and - by the evidence of recent history - remarkably unsuccessful. It also couldn't be more remote from the idea of a democracy or a republic. In a sense, the modern imperial age began hundreds of years ago with corporate war, when Dutch, British and other East India companies set sail, armed to the teeth, to subdue the world at a profit. Perhaps, corporate war will also prove the end point for that age, the perfect formula for the last global empire on its way down. Tom Engelhardt, co-founder of the American Empire Project and the author of The American Way of War: How Bush's Wars Became Obama's as well as The End of Victory Culture, runs the Nation Institute's TomDispatch.com. His latest book, The United States of Fear (Haymarket Books), will be published in November.